The junior varsity and varsity color guard's both placed first in their divisions at the Texas Color Guard Circuit Morton Ranch Competition. 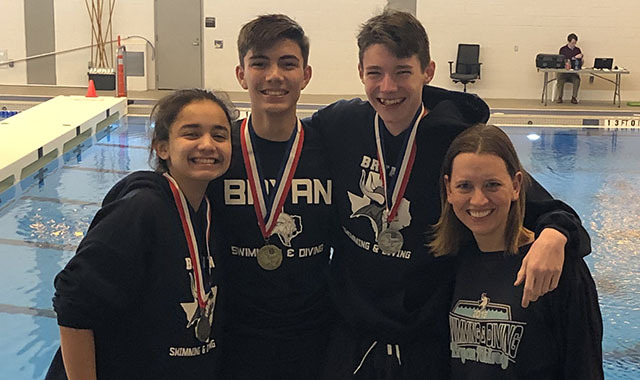 The following students took home honors at the District 18-6A Diving Meet: 1st Hayden Moreno, 2nd Ayden Ayers, 2nd Cayla Jimenez. Seniors Carlee Garret and Kayla Callen earned recognition as all-state choir members at TMEA. Welcome to the online edition of The Norseman, which is published during each academic school year and covers news, events and students at Bryan High School. Here, you can find all of the articles printed in the print edition of The Norseman, as well as additional articles, news, resources and student submissions. All information pertaining to Bryan High School, including Faculty & Staff directories, Extra-Curricular Activities, sports, and the school calendar can be found here as well. Please follow us on Twitter or like us on Facebook to receive news and updates. You can also download The Norseman iPhone App from the iTunes App Store. Although originating in Virginia, United Way has grown to have over 1,200 local offices across the country, including the Brazos Valley. Brazos Valley has its own local office and has created many opportunities for youth to get involved and learn how to be an active member in the community. Marvel Studios has taken over the cinematic world over the past eleven years and continues to do so in 2019 with Captain Marvel.